KELLER, Helen Adams (1880-1968) was an American author, political activist, and lecturer. She was the first deaf-blind person to earn a bachelor of arts degree. The dramatic depictions of the play and film The Miracle Worker made widely known the story of how Keller's teacher, Anne Sullivan, broke through the isolation imposed by a near complete lack of language, allowing the girl to blossom as she learned to communicate. Her birthplace in West Tuscumbia, Alabama, is now a museum and sponsors an annual "Helen Keller Day". Her birthday on June 27 is commemorated as Helen Keller Day in the U.S. state of Pennsylvania and was authorized at the federal level by presidential proclamation by President Jimmy Carter in 1980, the 100th anniversary of her birth. 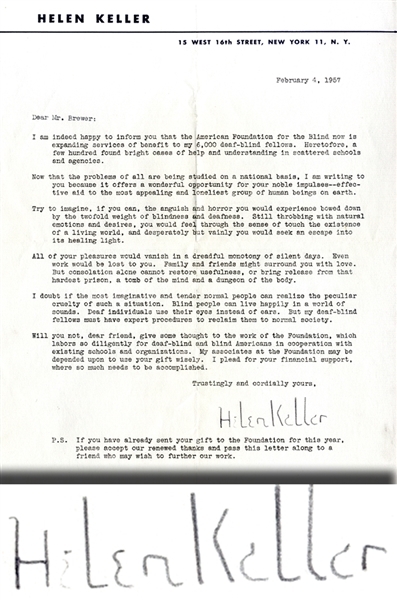 Typed Letter Signed “Helen Keller” 1pp. quarto, February 4, 1957, on her personal stationary, with great content pertaining to the current status of the blind and deaf population, it reads in small part: “... I am indeed happy to inform you that the American Foundation for the Blind now is expanding services of benefit to my 6,000 deaf-blind fellows. Heretofore, a few hundred found bright cases of help and understanding in scattered schools and agencies...” Fine condition.